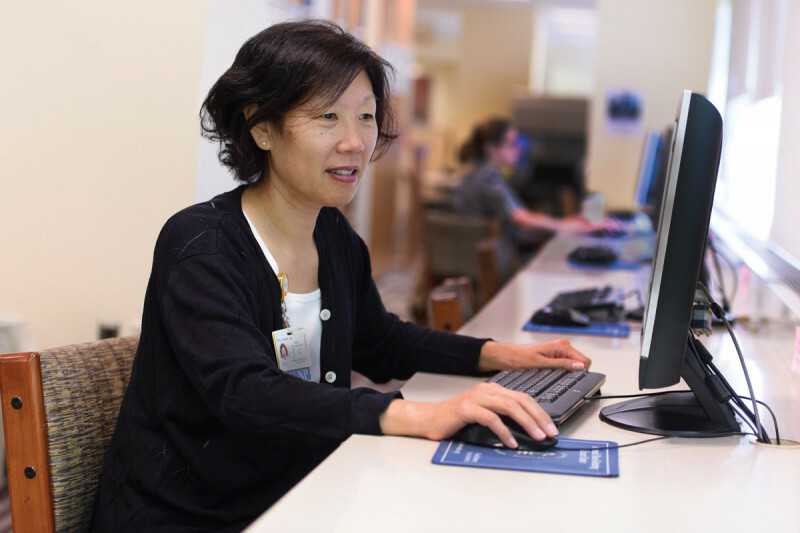 MSK nurse practitioner Tammy Son is working on research to help caregivers of patients who’ve had bone marrow transplants. Nurses are actively involved in improving patient care at MSK through cancer research projects. They’re also running clinical trials. Here, we interview three nurse researchers. Many nurses at MSK engage in cancer research as well as patient care. Molly Olm-Shipman is searching for ways to relieve a painful side effect of radiation therapy. Tammy Son wants to help caregivers of bone marrow transplant patients with specialized support. Randy Gross hopes to change people’s perceptions of nurses. All of these projects can improve patients’ experiences. Caring for patients is, of course, at the heart of nursing. But at Memorial Sloan Kettering, many nurses are also scientists, conducting research that is improving cancer care both at MSK and beyond. Nursing research has the benefit of bringing tangible change to patient care. “At the end of the day, when a nurse completes a successful research study and learns something about a practice change that would lead to better outcomes, we in turn adopt those practices here,” she adds. Nurses are also closely involved in other projects that impact patient care. A team including several nurses worked closely on the development of processes adopted at the Josie Robertson Surgery Center, our new freestanding short-stay outpatient facility on Manhattan’s Upper East Side. Michelle Burke, Nursing Director of Perioperative Services at MSK — along with surgeon William Hoskins, recently retired as MSK’s Executive Director of Surgical Activities — launched a pilot program called Ambulatory Extended Recovery (AXR) years before the facility opened. It looked at surgical patients who had brief hospital stays and who could potentially be moved to an outpatient recovery program that would get them home in 24 hours or less. They were required to achieve specific post-surgical milestones to see whether they could do well with the truncated timeline. The AXR pilot is now standard operating procedure at Josie Robertson. Nursing research studies also go beyond improving patient care, extending to include ways to better the practice of nursing itself. “Nursing research is all about discovery, in so many areas,” says Margaret Barton-Burke, Director of Nursing Research and immediate past President of the Oncology Nursing Society, a 39,000-member international nursing specialty organization. To learn more, we talked with three nurses leading research projects at MSK about their work. Molly Olm-Shipman is studying a way to relieve painful side effects of radiation therapy. She was inspired by that closeness to find a way to help BMT patients’ caregivers deal with the stress of supporting their loved one. Her project is a two-phase study in which she’s creating support materials, including booklets and the potential for an online component, that they can use anytime they need some help. “It will be a resource with proactive things they can do to help cope with their stress either alone or with the patient, and information about challenges they might face,” she says. It's hard watching families suffer, and trying to figure out what's best to alleviate that is so important to me. Randy Gross is researching stereotypes of the nursing profession. For nurse practitioner and clinical nurse specialist Randy Gross, his initial opinion of what would become his future career was influential on his choice of research topics. “I was never interested in nursing myself — my perception leaned toward the stereotype that nurses were mean,” he says. But when he began pursuing his PhD in nursing at the City University of New York Graduate Center, he decided to try to understand more about those misconceptions of nurses. He collected more than 300 surveys of undergraduate non-nursing students and is currently analyzing the data. “The hope is that the results will point us to marketing and rebranding strategies for nursing’s image,” he says. “By 2020, we will need 1.3 million new nurses to replace the 900,000 who are retiring. Ultimately, we need to attract more bright, warm, and competent young men and women to the profession.